This is a first book that I have come across based on dance and romance, two combination put together in anticipation to create some magic. And trust me, the book does manage to create a magic. 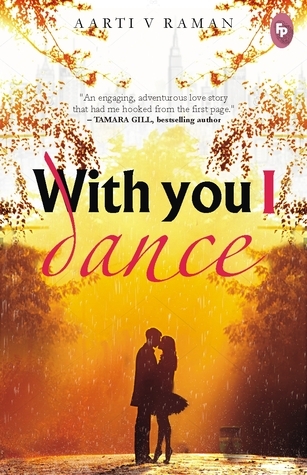 With You I Dance is a story of Meera, who pursues ballet, learns the dance while in New York, gets a performing assignment, but on the D-Day fails miserably and is fired from the job. Dejected, and with no choice left, she comes back to where she belong, India. While she tries to pick up the broken pieces of her heart, her relationship with her parents who does not understand her passion for ballet, there comes her Abeer. Abeer Goswami and Meera were sort of together while in New York, but then life is not always easy. So Meera now has to face Abeer as well, whom she left alone and waiting while taking a flight back to India. Plenty of troubles on her plate and she does not know what and how to solve them. So will Meera be able to dance again? Will Abeer and Meera be together again? I took an instant liking to both the main characters, Meera and Abeer. Meera is a dedicated girl to her ballet and thinks, drink, eat and sleep ballet. The passion to learn something against all odds and then fight for it made Meera a strong character in this book. Also, that passion, that attitude to learn something and fight for it, is something that left with me. Abeer on the other hand is balanced, well sort out character who goes all the way to help Meera when she is in desperate need for help. Some of the scenes between the two are simply emotional, strong and speaks much more. Even the no nonsense Zoya is a perfect combination of power, attitude and strength that she brings along with her. And finally, Meera’s brother bring that sibling love to the core. The story is very well written as I kept on turning pages right from the word go. There are timely twists and turns to take the story forward and it did not fail in entertaining me at all. Moreover, the editing is crisp and that adds all the more beauty to the flow of the story. Also, I did not find any proof reading error as well. Overall: I would definitely recommend to read this book as it has all the ingredients to keep you hooked and above all, there is dance and love. With You I Dance is the book for all romance lovers. So grab the book now!